Hot on the heels of one Clerkenwell post, I thought I would roll out another whilst it is fresh in my mind, strike whilst the iron is hot and all that. Another of my regular lunch companions throughout this period of unemployment is Catty. I talk about the pint sized Aussie a lot but she is cool and deserves the coverage. And she tolerates me which is always a good sign. Anyway, lunch was at Cafe VN, a little Vietnamese place just off Clerkenwell road housing a small but adequate menu. Serving mainly pho (noodle soup) and bun (cold noodle salad), it was getting a bit of bashing on twitter so I wasn't sure what to expect. I kept my options open and my stomach hungry, braced the Summer showers and headed for Clerkenwell once again. A simple lunch, Cat went for the pork bun and I went for the beef special pho, really needing something warming after having walked through the pouring rain, not something I expected to say in the first week of June. You know what, I was pretty happy with this. The broth wasn't as intensely flavoured as the pho I recently had at Cafe East but was better than the disappointing Song Que and had a good slow chilli burn. The three types of beef included meatballs (ok), brisket (ok) and strips of sirloin (better than ok) which bulked out the dish and throw in some decent noodles and vegetation in the form of spring onions, what you get is a decent bowl of pho. I can't say I was blown away by Cafe VN but definitely enjoyed it and it certainly didn't deserve some of the derision dished out on twitter (well, a few tweets anyway). Everyone is entitled to their opinion, and everybody has different tastes, but I enjoyed my meal and if I was ever in the area again needing a cheap and quick meal, I would be more than happy to pull up a chair at Cafe VN. I think you're spot on about this place. For the price and location it's a decent place to stop over for a swift and tasty lunch. I really like the bun noodles and the squid is great. The only disappointment for me was a very lacklustre salad. 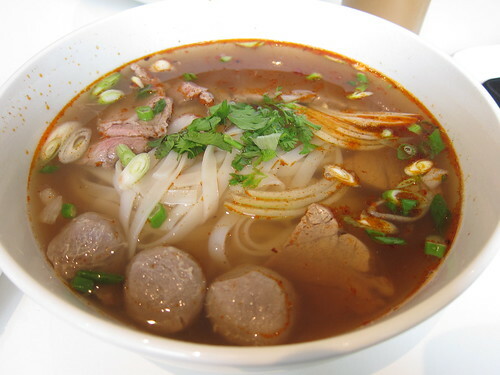 I'd go back again just for the thick noodles in the Bun Bo Hue. I had meal there with @thegrubworm and I was the only one to order Pho... I was quite disappointed as it was missing a real kick and the salads were bland. However, the Bun Bo Hue looked great. Good bun bo hue is hard to find.